The rotator cuff is a group of muscles working together to provide the glenohumeral (shoulder) joint with dynamic stability. 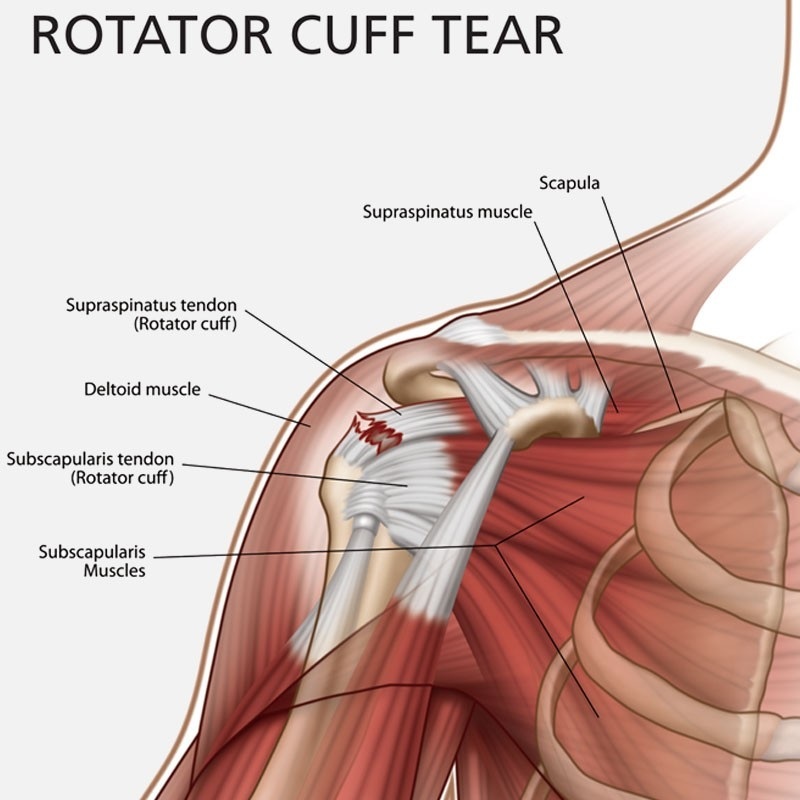 A rotator cuff tear occurs when there is an injury to one of the rotator cuff tendons. Rotator cuff tears occur in many shapes and sizes. The most common mechanisms of a rotator cuff tear are ‘repetitive use’ and ‘traumatic injuries.’ This injury is much more common in the older population but can affect all age groups. Tears in younger patients usually occur by either a traumatic injury, or unusual demands being placed on the shoulder, as seen in professional athletes. As people age, the muscle and tendons of the rotator cuff can lose elasticity, becoming more susceptible to injuries. For many rotator cuff tears, surgery can be avoided by rehabilitative physical therapy. Physical therapy focuses on strengthening rotator cuff musculature. Recovery from a rotator cuff repair depends on several factors including your level of strength before the operation and the severity of the tear. Some period of immobilization of the shoulder joint is needed to protect the newly placed sutures. After one to two weeks, physical therapy can be implemented. Initially, therapy is gentle, ensuring the repair is not disrupted. After four to six weeks, more active lifting begins. Several months after the repair, emphasis will be placed on dynamic strengthening the rotator cuff muscles. Complete recovery usually requires at least four to six months.